Here’s the story of the elves’ adventure. Every Christmas Eve Santa’s job is to deliver presents to the good little boys and girls. Up at Santa’s North Pole shop, two of his worker bees — Zoppo and Sheenette — are curious about what Santa’s up to out there on his long rides. So they decide to find out for themselves. On Christmas Eve, as Santa is getting his sleigh and reindeer ready, they sneak aboard and off they go. They ride along with curiosity unquenched, until finally they decide the time has come. When Santa comes up from his visit inside this special house, they sneak away and slide down the chimney themselves. Once there, they are amazed and often bewildered at what goes on inside a real house, with real creatures they’ve never seen before. “This book is great fun! And it’s bound to be a fun-stirrer when Grandparents (like me) read the tales to their Grand and Great-grand kids, or when the kids’ parents read to them. Kids love to hear poems about snoopy elves, puppies, sneaky cats and cuckoo clocks, and the excellent illustrations add punch and fun. Good holiday fun for sure.” Katrina Custer, Grandma/Great-Grandma and well-proven storyteller. “The wonderful and artful illustrations immediately set us in the Christmas spirit and helped all of us fully to enjoy the journey of these curious elves. The story with its charming rhymes gave such a delight to the story teller and to the children. This story should remind us all to take a break from our busy lives in order to explore what meaning belies our daily duties and lives.” Michele Family Daycare (Michele C. Valencia and Denise M. Valencia). “This is a real gem. I loved its poetic tale of the wayward elves and the illustrations that show them meeting the puppy, cat and more friends that they, as North Pole worker bees, have never before seen. A real fun story that I enjoyed and I know children of many ages will also get a kick out of.” From Trisha Yeager Menke, author of Potty Talk by Toast: Strategies for Bonding with and Training Your Lovable Cat (ToastNHoney Publications). 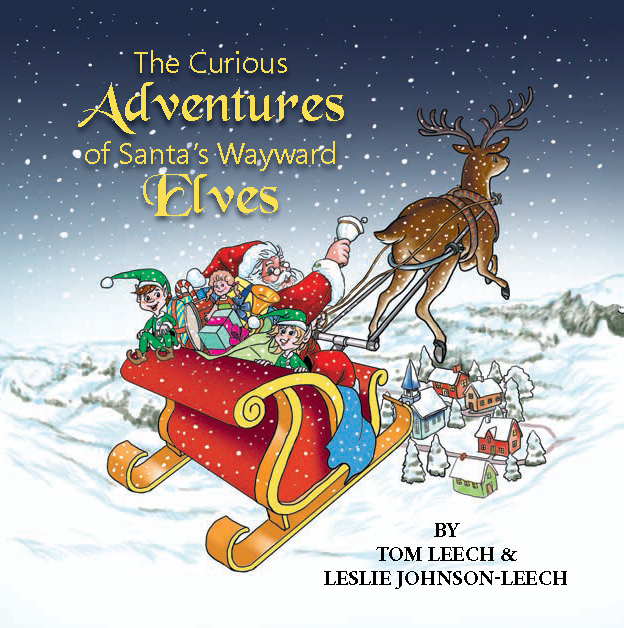 Santa’s Wayward Elves, softcover, 24 pages, color illustrations. $15.99 and e-book. To purchase, visit online at www.xlibris.com.